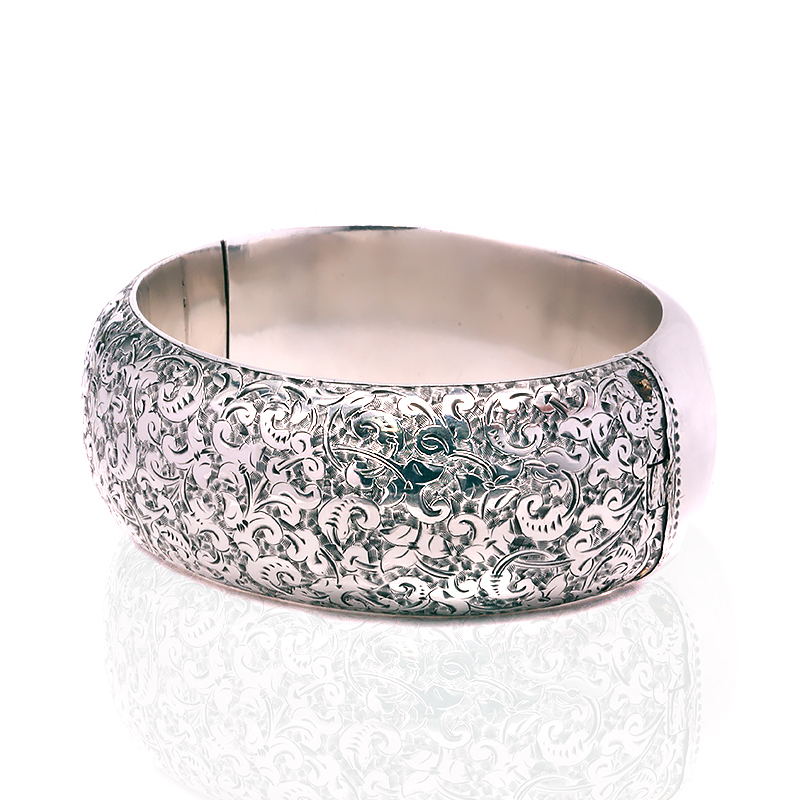 Product code: ES8149 Categories: Antique, Antique Bangle, Silver & Silver Plate. 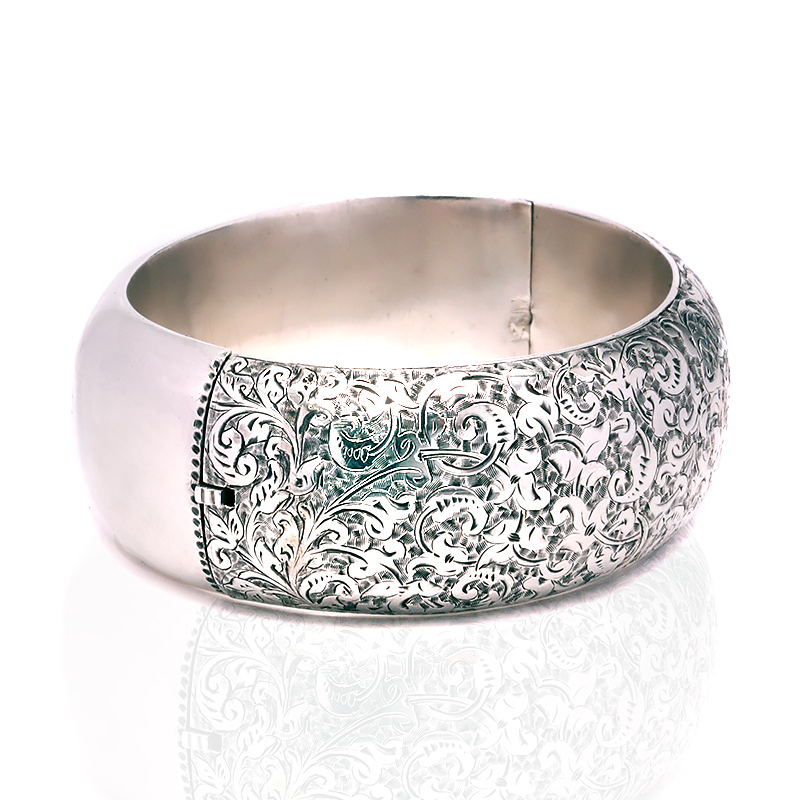 Here is an exquisitely hand engraved antique sterling silver hinged bangle that dates from the late Victorian period of the 1890’s and not only has the most incredible engraving but is also domed making it so very unique and special. Measuring 25mm wide, the engraving on the front would have taken days if not weeks to complete as it was all painstakingly done by hand well over a 100 years ago. With such a fabulous tactile feel to it to the touch thanks to the engraving and lovely curve to it, this is one antique bangle that certainly stands out from the others. When you consider that all of this engraving was done in a time without modern equipment and tools like today, it gives you even more of an appreciation to the jewellers of this time and what they could achieve. Being hinged also allows it to sit nice and close to the wrist and regardless of when or where this is worn, it will certainly get the admiration that it deserves. This antique sterling silver bangle has been amazingly hand engraved. With a lovely domed shape to it, this is one of the finest antique bangles around.